Our older cat Brodie has hip problems. He can still climb pretty well. He loves the lap, but the lap is not always available for nap-time. We have a multi-level cat condo with enough room for each of our three cats to have his own elevated spot. 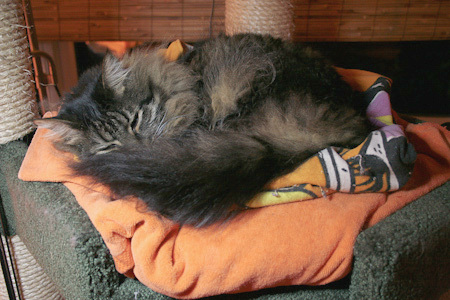 To give Brodie a warm soft spot to curl up, we put a medium sized heated pet pad in his space on the condo platform and topped it with several layers of folded towels. Some of the heated pads are too warm for our kitties and most of the pads don't have temperature controls. Having a couple layers of towels add cushy softness and help disapate the heat. He is quite comfortable with this arrangement. 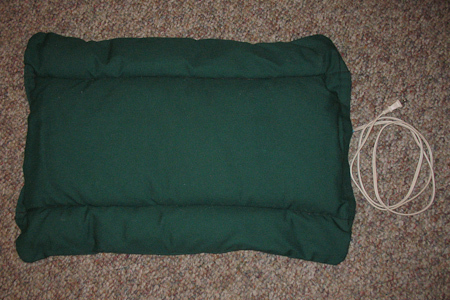 It is important to distinguish between heated pads and heated beds with sides. The pads we use and what I am recommending here are flat or padded, allow maximum flexibility, rarely get dirty if you keep them covered, and most have a removable cover anyway so it can be washed if necessary. We have three of these heated pet pads and they are all fairly low wattage (about the same as a light bulb), so you can keep them on 24/7 during the cold season. If you are concerned about power usage or safety, you can use an inexpensive appliance timer to turn it on and off automatically. Just make sure the appliance timer is electrically rated for the pet bed. In warmer months, Brodie prefers a "cool" bed, so in the Spring, we remove the heated pet bed and just give him layers of towels.